You may have wondered about how the Penguin Amnesty and how it all worked out. When all’s said and done, I posted out approximately 6o donations of penguins and penguin merchandise to poorly kids and with the help of Parcels For Delivery and their wonderful Round Up Your Pound campaign, we raised £852.19…..£100 of which was donated by them as part of their annual Christmas donation. You’ll just have to imagine muffled penguin squarking that was going on at that point. They were so excited about going to their new homes! Here is a link to their page which outlines how Parcels for Delivery supported the Penguin Amnesty. They are simply amazing and if you’re ever going to post a parcel, they’re the company to post it with! Love ’em! And…if you’d like a nosey at the penguins people kindly donated, and the mischief they got up to, have a look HERE! This penguin would like to say thank you for all your donations, unfortunately he’s drunk so he can’t string a sentence together so I’m saying thank you on his behalf. It was one of the strangest, most successful charity blogging projects I’ve ever been involved with and it seriously restored my faith in people and their capacity for selfless giving. Thank you so much. I still have some penguin prizes to send out, and although they are terribly, awfully late (in typical me stylee) they will be posted at some point. I have not forgotten. 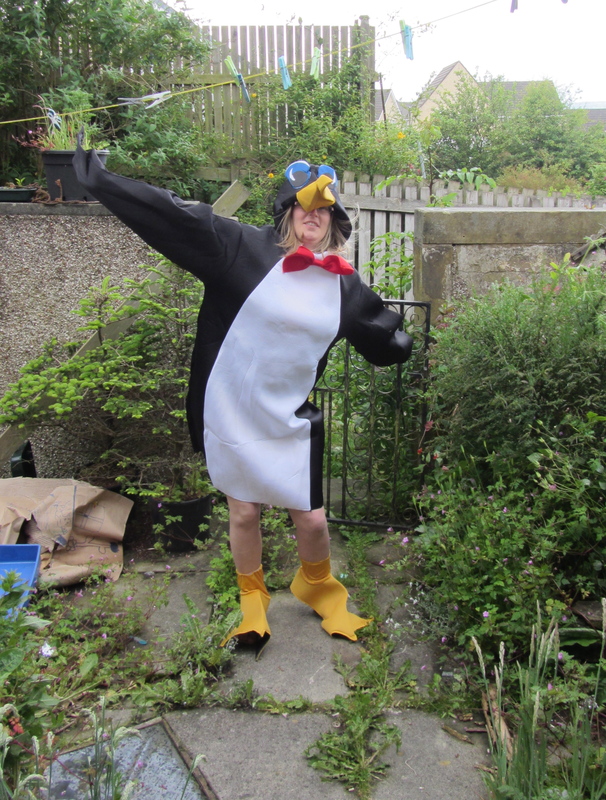 It is a grown up size penguin costume so I couldn’t send it to any of the children so the plan was to use it for publicity purposes only. With that in mind, if you would like to own your very fabulous penguin outfit, please simply comment on the blog to say that you will visit the Post Pals page and at the very least think about sending something to a PostPals kid. That’s all you have to do. I’ve decided to post out a brand new penguin outfit directly from Amazon to the winner who will be chosen on the 1st June. Here’s a link to the prize! Don’t you think this would be fabulous for Halloween (you could be a zombie penguin or something) or for a kid’s party? If you listen carefully you can hear the sound of muffled nook-nooks…. 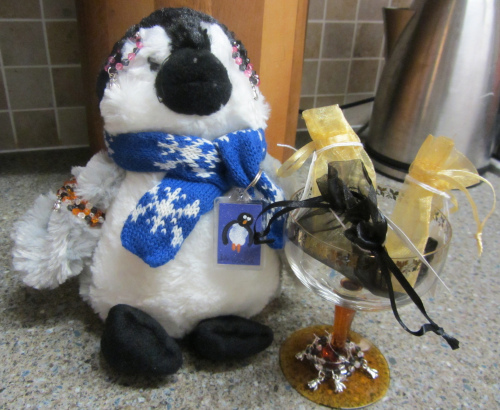 Anyone who donated a penguin, a penguin related item, or made a donation was put into a prize draw for one of the items modelled below by a helpful penguin who will soon be sent to a PostPals child, along with all of his other penguin mates. I’m too thick to know how to install Rafflecopter or anything, but I do know how to be fair. So I dutifully wrote everyone’s names down and randomly chose four of them. Here are the results! ButtonF1Fan (Julie Marlow) won the sparkly penguin bracelet. Staffstechgirl (Helen O’Keefe) won the penguin earrings. CupCakeMumma won the handpainted penguin keyring. All of these prizes were donated by Dylan Ward (DylanWardArt31) to help out with the Penguin Amnesty Project. Thank you Dylan! Please could all the winners contact me on Twitter with their addresses via Direct Message , you’re all on there so that’s handy! There’s now a Penguin Amnesty Gallery Part 4 for you to have a look at if you like? This project will run right through to the end of December with the support of the wonderful Parcels For Delivery. Penguin Amnesty Gallery Part 4! 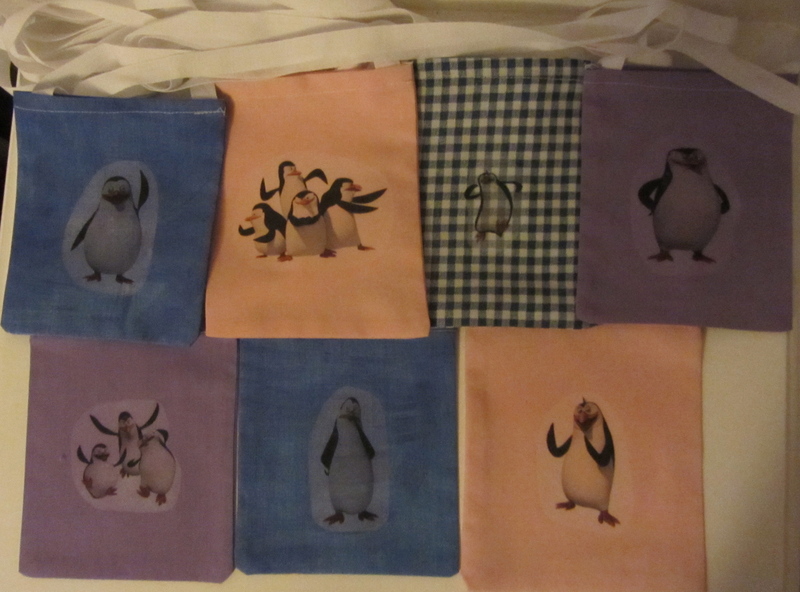 If you’re a newcomer to the blog, you may be wondering why I’m having an Penguin Amnesty of all things. It’s a bit of a long story, but if you read this post HERE, it explains things a little. I’m collecting them for the Post Pals charity and this is all sponsored by the fabuloso (I watch too much Dora The Exlorer…) Parcels For Delivery! Here’s a link to Parcels For Delivery’s official sponsorship page. 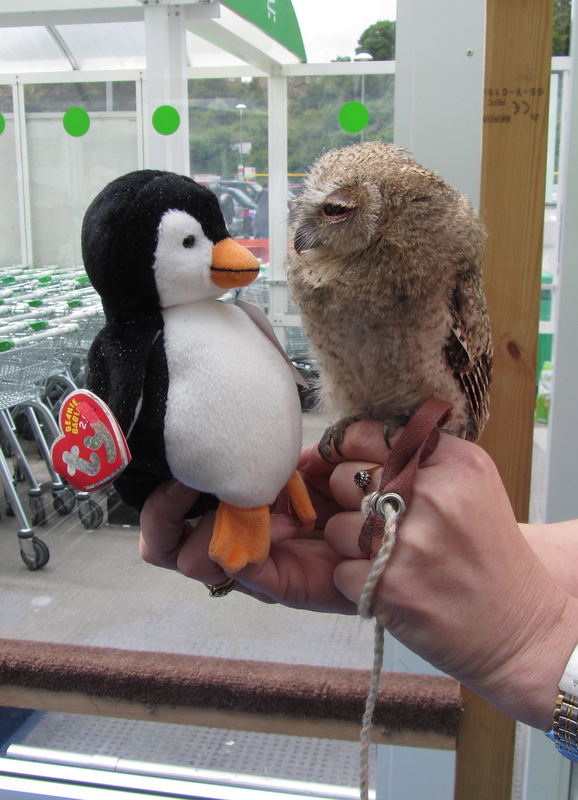 They’re supporting Post Pals and the Penguin Amnesty. I love ’em! Couldn’t resist including this link. You HAVE to watch it to the end! I never knew penguins made this noise! If you’d like to see previous galleries featuring the often mischievous penguins marauding around my home, please follow the links below. You’ll be glad you did! Penguin Amnesty Gallery Part 1 – Click HERE! Penguin Amnesty Gallery Part 2 – Click HERE! Penguin Amnesty Gallery Part 3 – Click HERE! We have some newcomers to the Brink of Bedlam household, penguins with unusual skills and habits. We’ve had to lock the booze cupboard put it that way…. I went out shopping for the afternoon and came home to this?!! 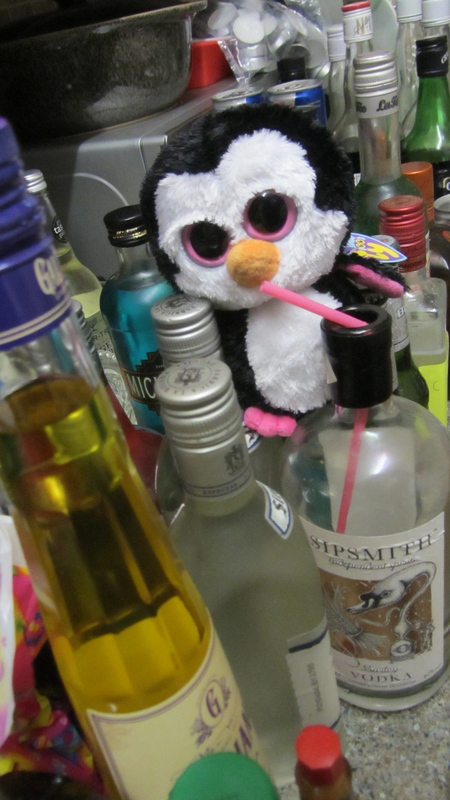 Do they do an Alcoholics Anonymous for Penguins? G’iz the phone number will you? Please? This little alcofrolic (ie, alcohol makes them frolic shamelessly) penguin was donated by Inky Prints. I’d have preferred them to have admitted him to rehab for a fortnight before he got to our house, but hey ho! There’s an absolutely wonderful group on Facebook called ‘Team Tubey’ who make free medical accessories for children and adults who use medical tubes. They very kindly offered to help out the Penguin Amnesty project and a lady called Nadda Jabbour made and sent the buttons shown above and the bags shown below. These will all be sent to Post Pals kids who use tubes and can make use of them. 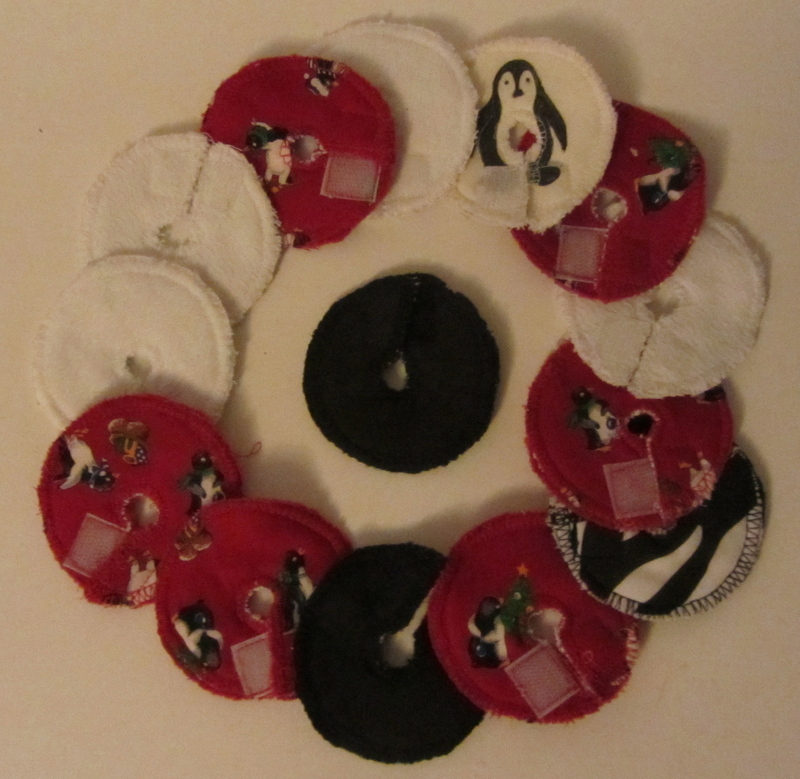 If anyone would like to have a go at making penguin themed buttons there is a pattern HERE you can follow. It looks fairly straightforward as far as I can see, and any help is much appreciated! Medical accessory bags for children with stomas. Cute as….well… penguins! Priscilla the Penguin likes horticulture, unfortunately horticulture doesn’t like Priscilla the Penguin. He has brown flippers rather than green flippers. :O( Dead pepper plants. Oops. Misi Handmade sent me Priscilla thanks to SuperCute Crochet Dolls and they also sent this absolutely beautifully made Emperor Penguin drawstring bag from MinXtures. Thanks so much to them for their lovely donations! 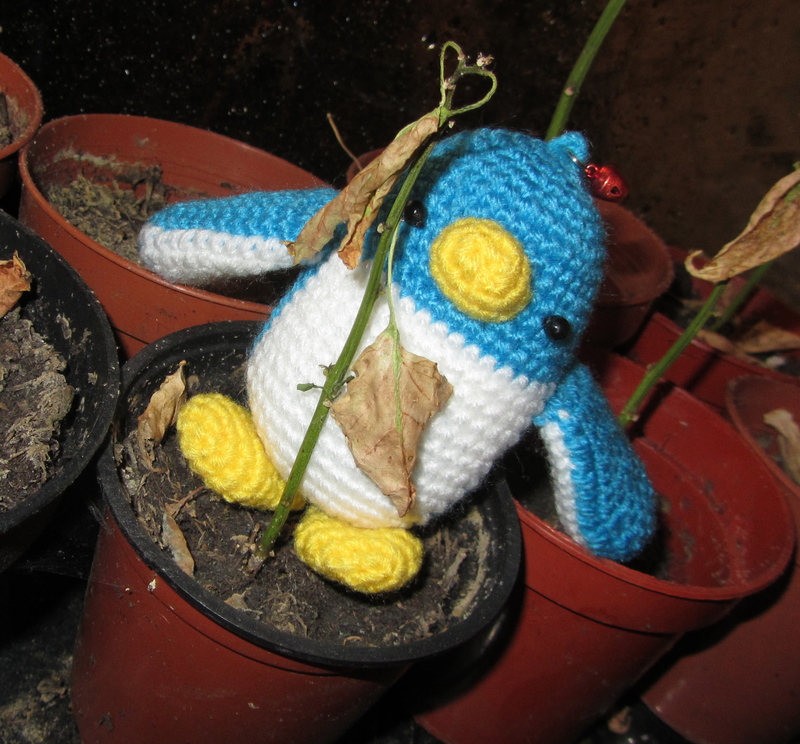 By the way Misi, please could you tell me the best way to tell a penguin that she’s actually crap at gardening? Priscilla keeps trying, but she’s murdering my plants! Help! The penguins have no excuse for losing their PE kit now! The penguins now have ‘Penguin Pin Ups!’ I saw Priscilla staring at these posters the other day and she actually said ‘Pwoaar!’ I’m presuming these are the Kate Moss’s and the Brad Pitt’s of the penguin world? 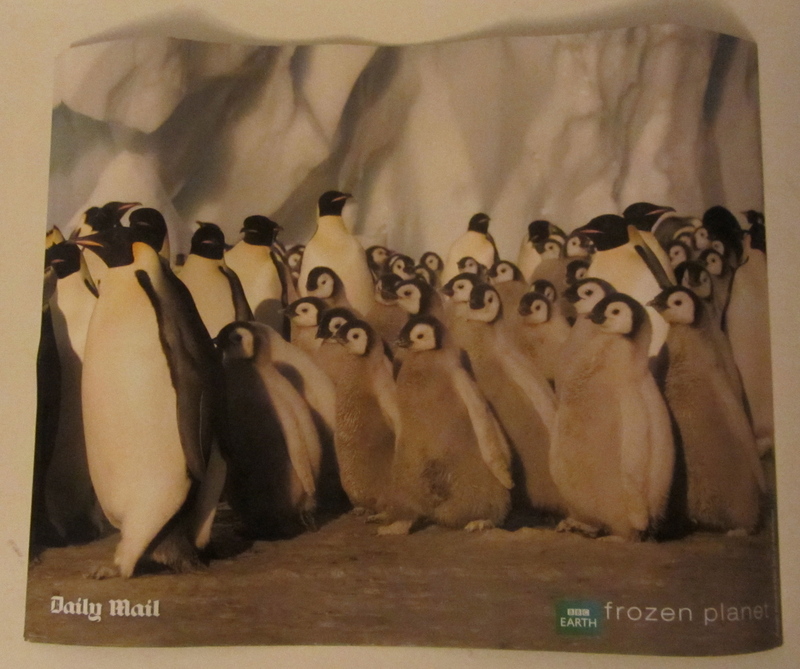 Kim Lawrence sent 10 Penguin posters to donate to the Post Pals kids, thank you very much! (they aren’t creased by the way, it’s the ice-bergs doing their rippling sort of thing). 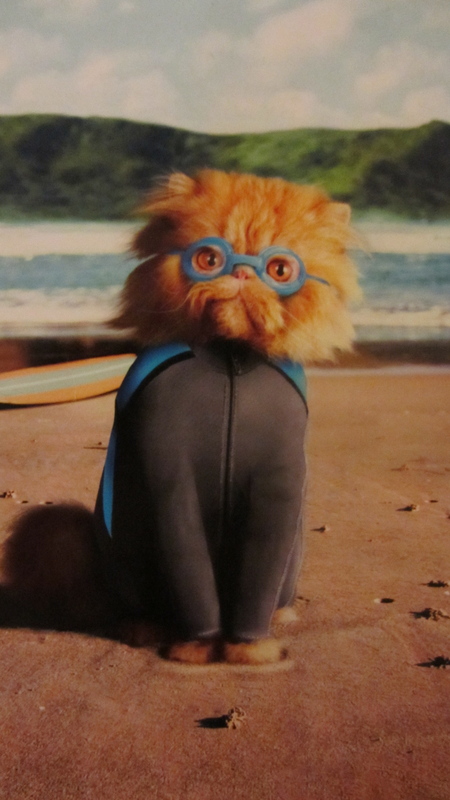 This is not a ginger penguin, this is a cat in a wetsuit wearing blue glasses. It’s just Kim Lawrence included this postcard and it amused me so much I had to post a pic even though it’s not a penguin. Just couldn’t help myself! These are stunt penguins. One of them told me they used to perform in the circus. Please note the careful balancing act they perform and they way the top one is teetering just a little…. Daring little birdies! Pabobo sent the Penguin Amnesty five Lumilove Penguins, they glow in the dark and erm…do circus tricks. It doesn’t say that on the packaging you know! *nods knowingly* I should imagine they’re very comforting penguins on long dark nights. You can find more about them HERE. So there you have it! An updated Penguin Amnesty gallery! As Parcels For Delivery is officially now supporting PostPals, they are also accepting penguin donations, so if you’d rather send donations to them rather than me, feel free. The postal address is on their sponsorship page which is at the top of this post. Alternatively you can contact me on kay@rubbermonkeys.co.uk and I’ll be happy to supply my details re. posting penguins. Please do consider supporting the penguin amnesty, whatever you have that is penguin themed and suitable for a child, please do send it our way! 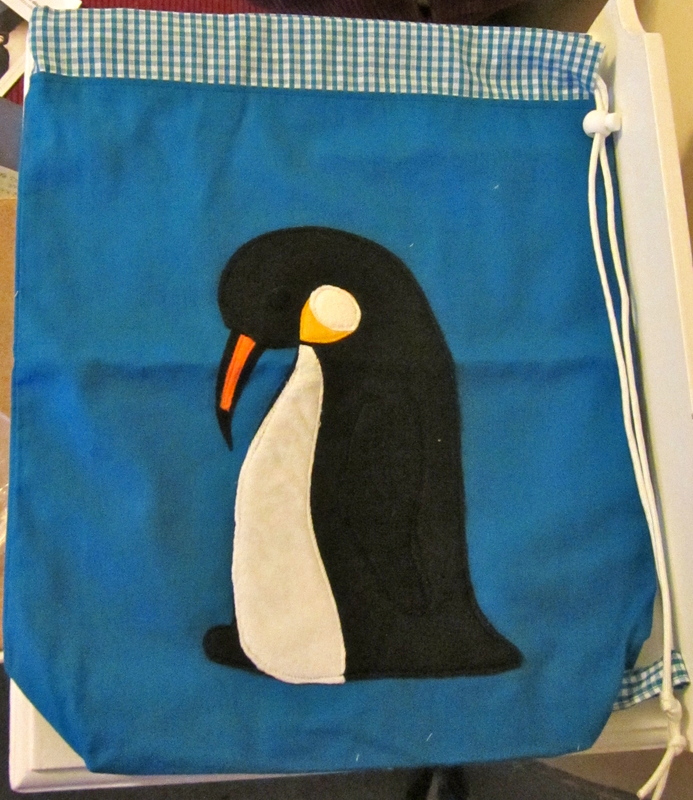 We’re accepting penguin toys, penguin clothing, penguin pictures, penguin books, anything penguiney or arctic themed! The only line I draw is that we don’t want ‘real’ penguins. The zoos are rather possessive over their penguins and frankly I don’t have room in the bath. 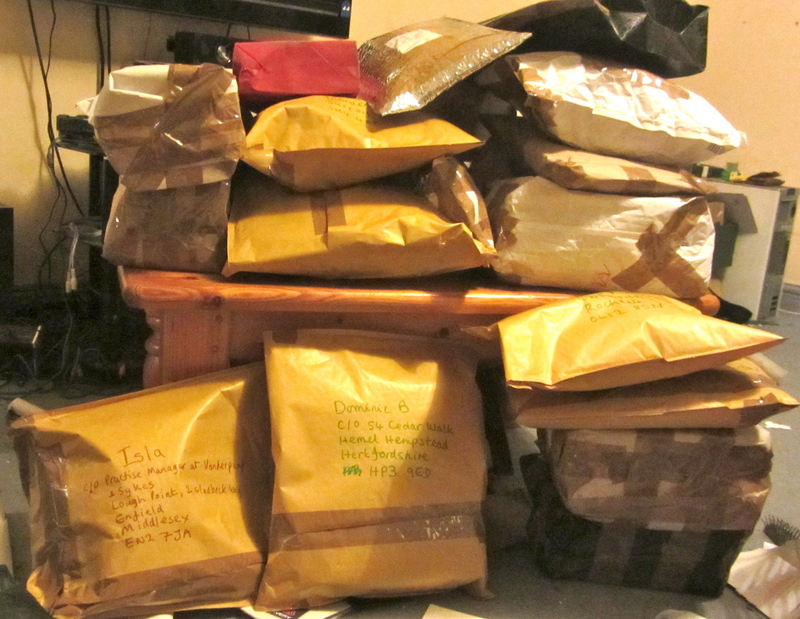 Thanks so much for reading and keep your eyes on the gallery as more and more penguins are collected for Post Pals! Thank you! Penguins and Parcels For Delivery! Just to get you into the swing of things all Penguiney, this is a visual illustration of how I’ve been over the summer hols. I’m so thankful for the British Education system and for all the wrong reasons! Freedom! I did this because I adore my new fridge freezer and I couldn’t believe my luck when it I was chosen to review it. I decided I’d pass on some of my good fortune by running the Penguin Amnesty campaign. Every single penguin or donation is being sent onto Post Pals after the Penguin Amnesty vlog – coming soon to a puter near you! 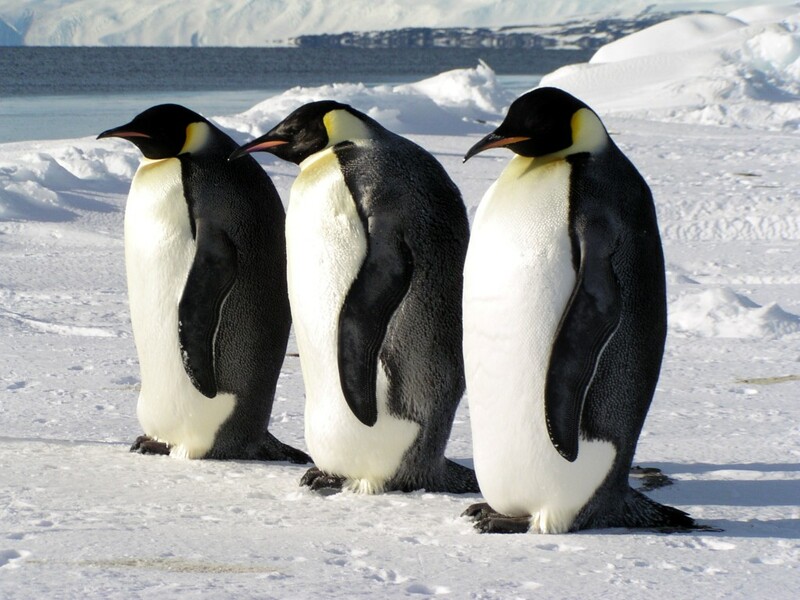 Basically the tenuous link between the freezer and the penguins is that penguins like cold things, like erm…freezers… so they show it off quite nicely…and it’s great being able to find lovely new homes for penguins with kids who will love them. That’s the train of thought anyway. It makes sense in my head anyway! The Penguin Amnesty galleries can be seen below, the idea is to show the penguins in their unnatural environment (ie, my home) and credit everyone for their generosity. This is still being updated as penguins are still arriving! There’s three Penguin Amnesty galleries because the campaign has been so much of a success that I ran out of room on one blog and had to extend it. Happy days! ‘Twit-Twoooooo Whooo are yoooouu!’ One of my favourite photographs from the Penguin Amnesty gallery donated by the lovely Rhoda from the ‘Ramblings of a Foggy Mind blog.’ Thank you Rhoda! Please do remember that anyone who has donated a penguin for the vlog or who has sent me a donation is being put in a prize draw for some penguin prizes – this is being drawn after the vlog has been completed. The absolutely hilarious penguin outfit that was sent to me by my Twitter mate Jo Bean will also be auctioned in aid of PostPals, it’s adult sized so can’t be posted onto PostPals kids, unless I can find a 5ft 7 child. P4D, otherwise known as Parcels for Delivery have chosen Post Pals and the Penguin Amnesty project as their nominated charity for the months of November and December. They’re supporting BBC Children In Need at the moment, but we’re next in line! I’m so excited! If you want to have a beaky at their current charity sponsorship and how it all works please click HERE! So if you have a passion for penguins and Post Pals you can send penguins to me and I will feature them on yet more Penguin Amnesty Galleries. Post Pals will also receive penguins from P4D customers and in early January, P4D will ship these penguins squawking en masse to me. I’ll post them off individually to Post Pals kids with the names of the people who donated them. By that time Parcels for Delivery have all the donations in and the penguins will have their postage plus a bit extra hopefully, all accounted for. Neat! Sorry if I’ve over-explained things, I just think it’s important that you know what I’m doing considering how generous so many of you have been. Post Pals, Parcels for Delivery and I will make sure your penguin donations reach the homes and hearts of Post Pals children, many of whom deal with painful and crippling diseases and conditions on a daily basis. The plan is to bring some smiles to their faces, raise awareness of Post Pals and to pass on some good old Christmas cheer. The campaign will end in January once the penguins have been posted, brightening the start of the new year. 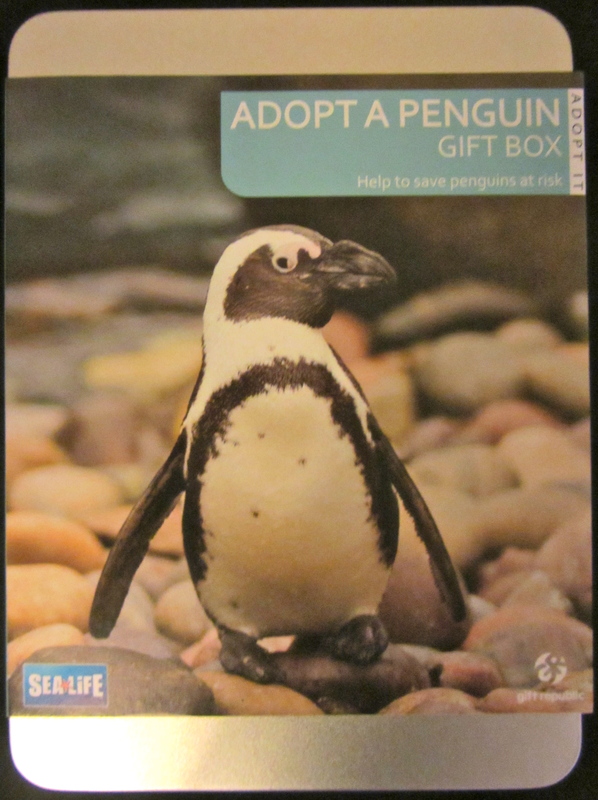 Although real penguins are cute, I really don’t expect to find a live one in a box. Please refrain from stealing from zoos, thank you! Well, what do you think? And more importantly, what will you do? Can I suggest that you send me a penguin? Please? Pretty please with fish on the top? The Penguin Amnesty Gallery Part 2! I just cannot believe how successful this blog review campaign has been! Thanks to Appliances Online and their fabulous fridge freezer for their inspiration and thanks to everyone who has donated so far! Spot the Penguin! I’ll be doing a straight review (without penguins) later this week. 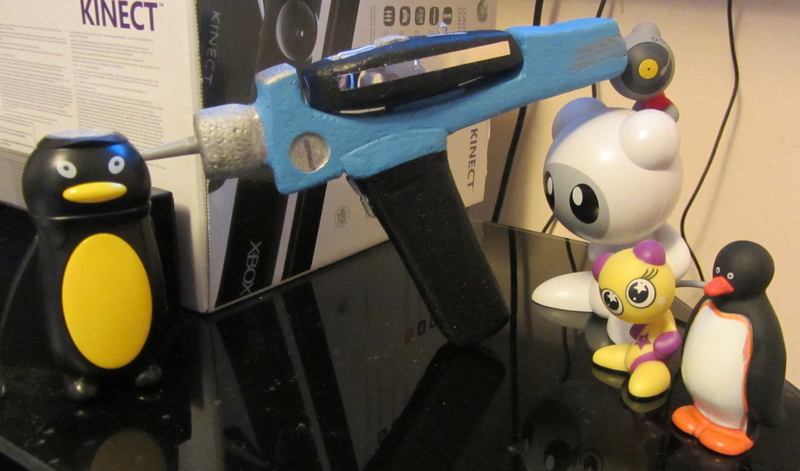 The penguin vlog will follow shortly afterwards so if you want your penguin featured, be quick! All these penguins just keep on flip-flopping and slippery-sliding their way over here! It’s wonderful to see just how generous people are and how thoughtful they are too. I’ve run out of room on the first The Penguin Amnesty Gallery so I’ve had to start a separate post. If you’d like to view the first gallery, please do waddle your merry way over there and have a nosey (or a beaky) at how many there are now, and see how they’re settling into their temporary home before they’re posted on to the Post Pals charity. I must say I still can’t get into the bath, or use the sink because of Peter and his mates, I must remember to try and tempt them out of there with tins of salmon or something. The first Penguin Amnesty gallery is HERE There are penguins playing footie, directing cars, playing in the bath, flower arranging…. Anyway! Here’s more penguin pics! I bet you can smell the fish from here! Phoooey! Hold your nose if it all gets a bit much. You’ve heard of that old favourite ‘Chicken-in-a-Basket?’ Well here’s ‘Penguins-in-a-Basket!’ We shan’t be eating these though. That would be wrong, wrong, wrong! 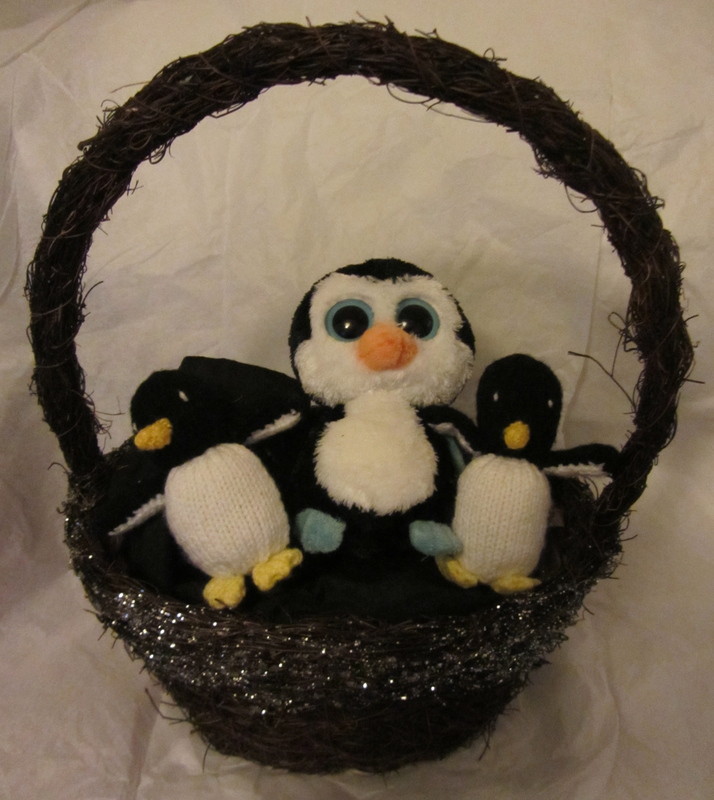 Pinky and Perky, the knitted penguins, were sent by Elaine Kidd; she very kindly sent two of them in case one of them got lonely. They have made friends with Percival in the middle who was donated by Margaret and Anna. They are getting on quite swimmingly, perhaps too swimmingly… They’re all bathroom pests! Somebody save me from a fate worse than stinky! 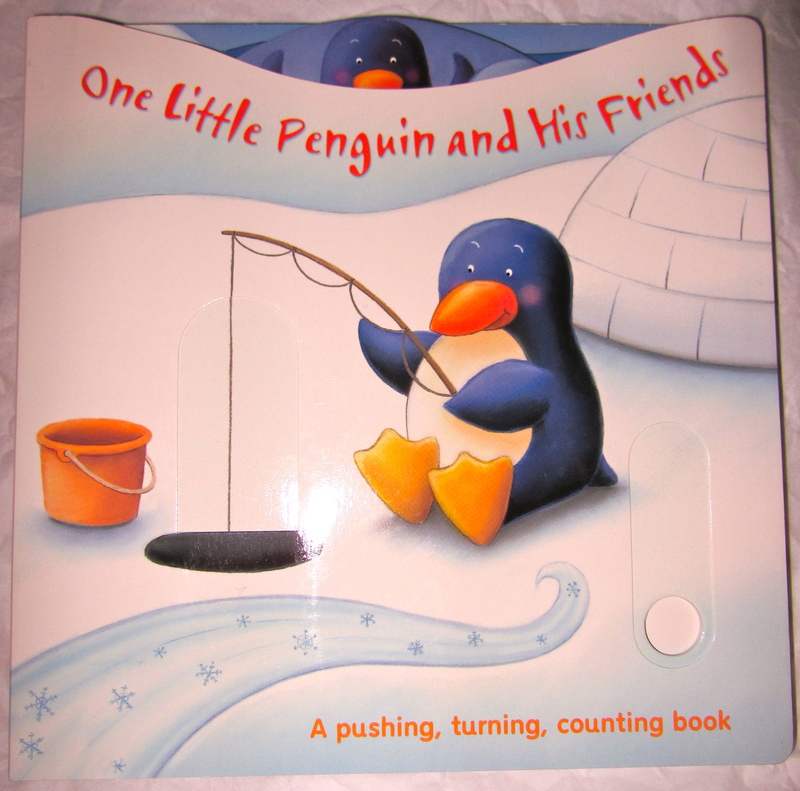 Top That Publishing sent some gorgeous Penguin themed children’s books, they are so cute and will be very much loved by the Post Pals children. Here they are! 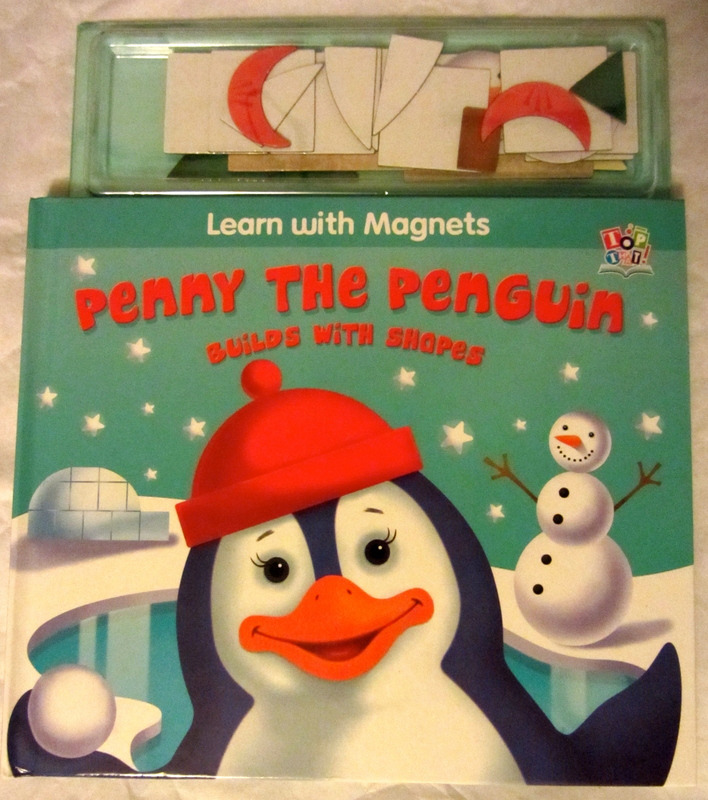 Mummy Barrow from the Mummy Barrow blog sent gorgeous little penguin book about being brave, and some chocolate ducks which look like penguins if you stare at them at the right angle and imagine that they’re black and white. I thought this book was particularly appropriate for Post Pals. 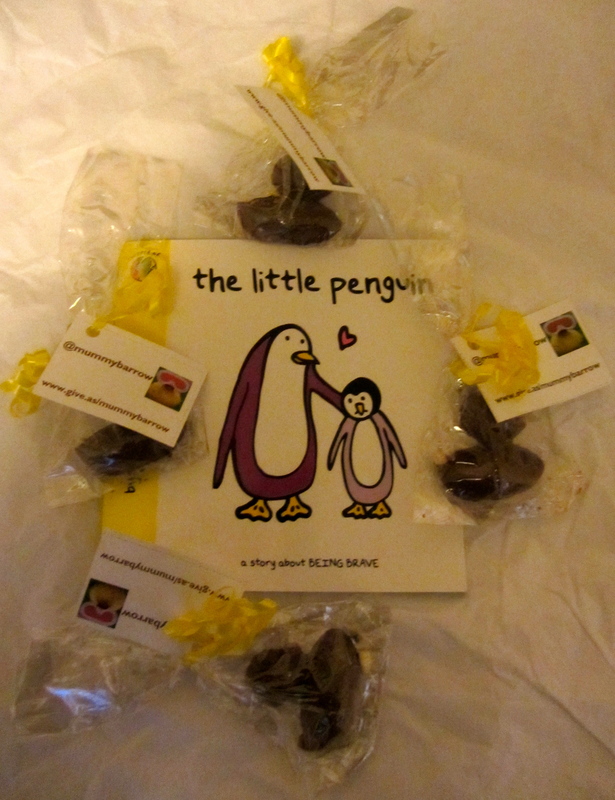 The Prezzy Box have donated a Penguin Adoption pack for a little penguin fan. Many thanks to them for being joining in with the Penguin Amnesty! Imagine having your very own adopted penguin! Some little girl or boy will love having a penguin in the family! And finally (for this update at least) – this is my favourite photo of the evening. 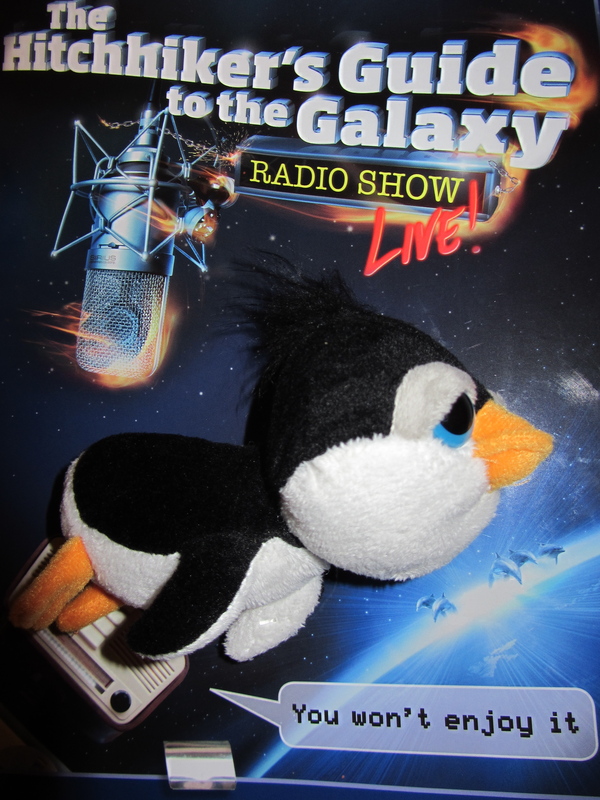 I have put a penguin in space! Douglas Adams didn’t feature many penguins in the Hitchhikers Guide to the Galaxy, so I’ve remedied that. The universe needs more penguins in space. I think they’d like it. Patrick the Penguin does anyway. See, he lurves it! He’s floating around in space exactly the same way a brick doesn’t. Over the last week I’ve had a ton of penguins arrive on the doorstep looking lost and bewildered. I think they were a tad worried about where they’d ended up. 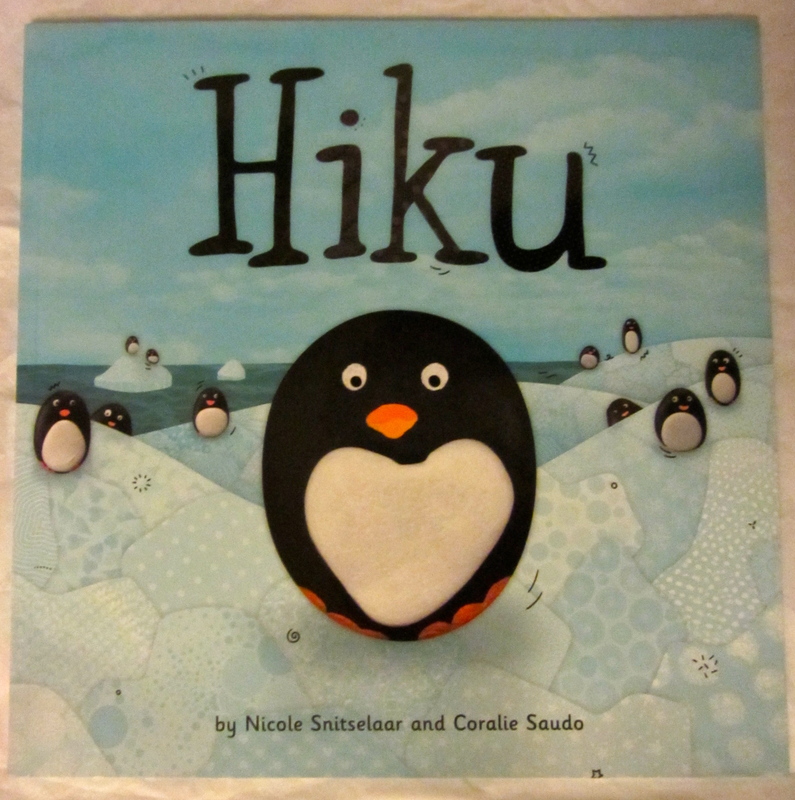 One in particular, sent by Liz Burton from the Me and My Shadow blog and Vita from The Goriami Family blog, was in a parcel that said ‘To the Penguin Catcher!’ Let me tell you, she was one nervous penguin! Poor thing thought we were going to cook her! She calmed down eventually after some reassurance and a tin of tuna at least. Here she is! ‘Pimelda’ likes shoes! In the morning I get up, I put my socks on, I dash around looking for footwear, and what do I find?!! 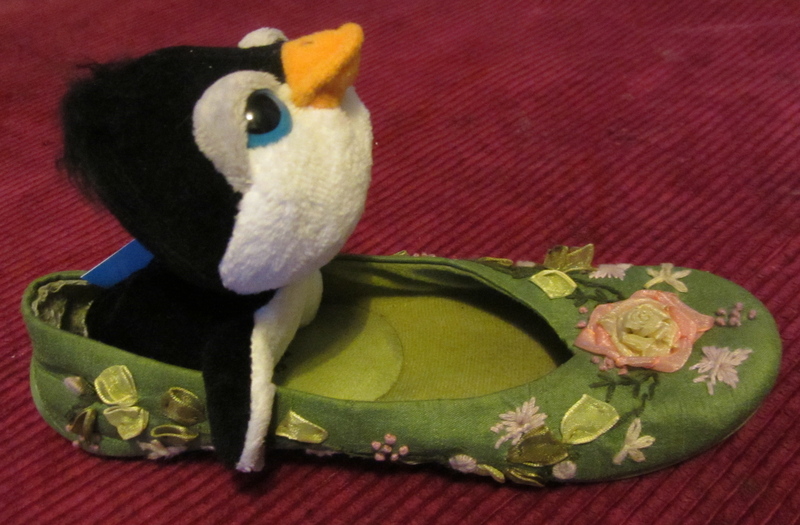 A penguin snoozing in my pumps! They’re a damn nuisance I tell you! Nearly trod on this one the other day. Next we have Persphone! She likes to give out the orders around here, and it’s not just the penguins she harasses either. Look at this! Yes we have a plush moose head on the wall! Persephone the Penguin is very perplexed by this, and thinks that it this is simply a moose that has run into the wall too fast and that the rest of its body is stuck next door. She doesn’t ‘Nook-Nook!’ or ‘Sqwark!’ she sits on top of the poor thing and shouts ‘Back up a bit!’ and ‘Reverse NOW!’ all the time. 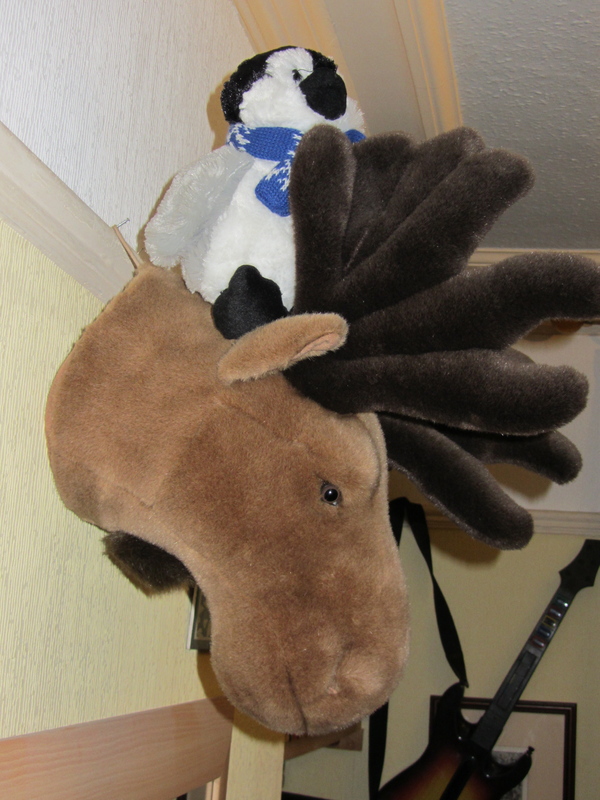 The moose refuses to move and she’s just stuck up there on her pointless penguin mission. Poor love, she has the best of intentions I’m sure. 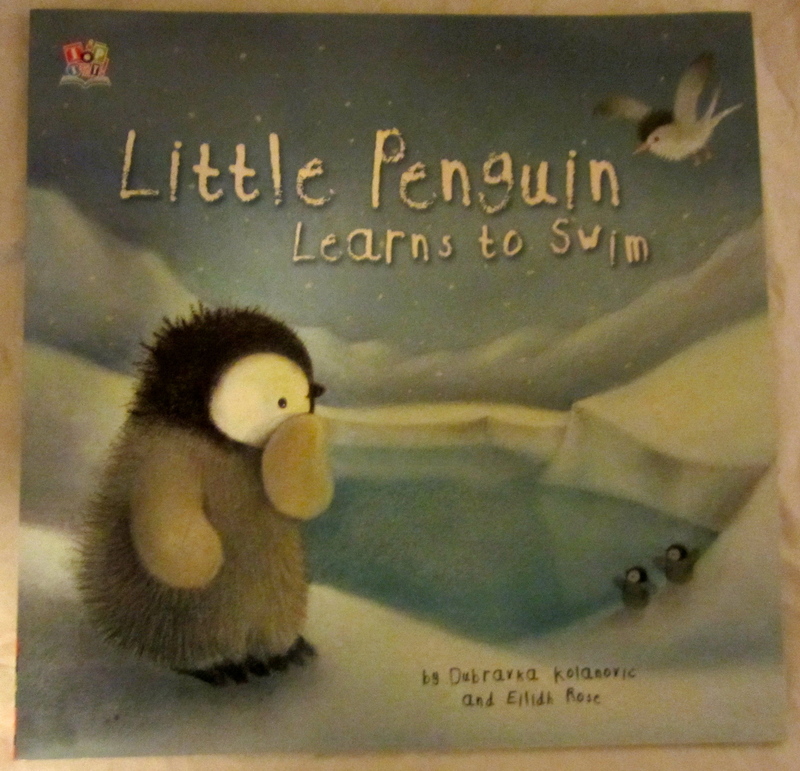 Many thanks to Dylan Ward and his mum for sending this very determined, (even if slightly misguided) penguin. Please do have a look at his website called Dylans Wonders, this lad really is crazy about penguins and has a heart of gold too, he’s literally raised thousands for charity and is an inspiration really. 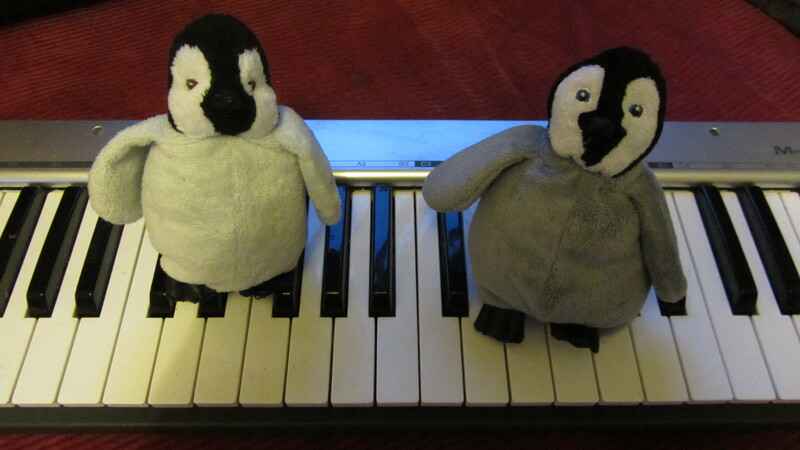 Who in their right mind teaches penguins how to play the keyboard! Elaine, I’m not happy you know. 3am, I’m just dropping off to sleep……and then they’re off again playing ‘Tiddle-Om-Pom-Pom’ and shouting ‘Fish!! !’ in the scale of C. Driving us potty they are! Night after night! I thought the kids were bad, but they’re nothing compared to Pyche and Pugsley. 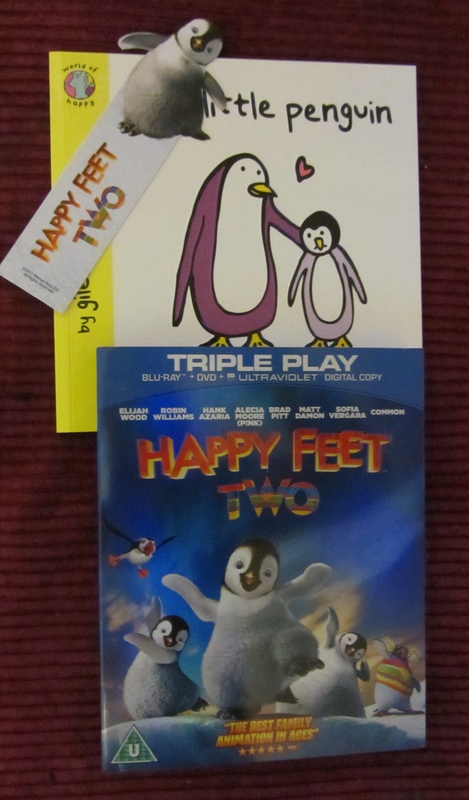 Liz Burton also sent a very cute penguin book, a penguin bookmark and a Happy Feet Two DVD! Thank you! This penguin calls himself Romeo, he’s a little charmer. 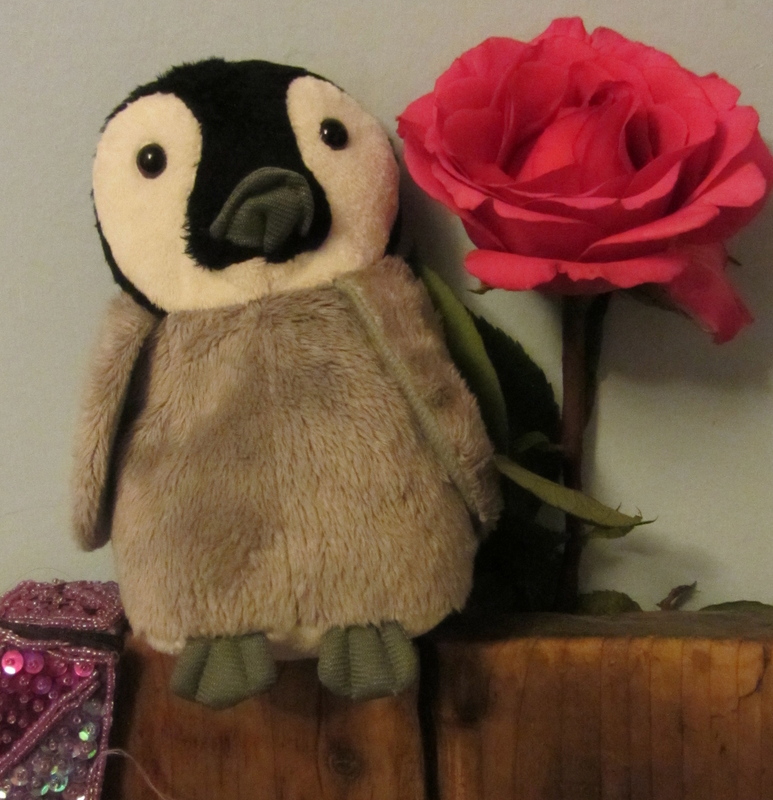 The rose was nicked from our garden after one of his moonlit waddles, I think he’s after Persephone to be honest, he keeps grabbing the rose in his beak and waving it at her. So romantic! Zoe Toornent sent us Romeo, and the two other penguins shown below. Thanks Zoe! We love them and a PostPals child will love them too! 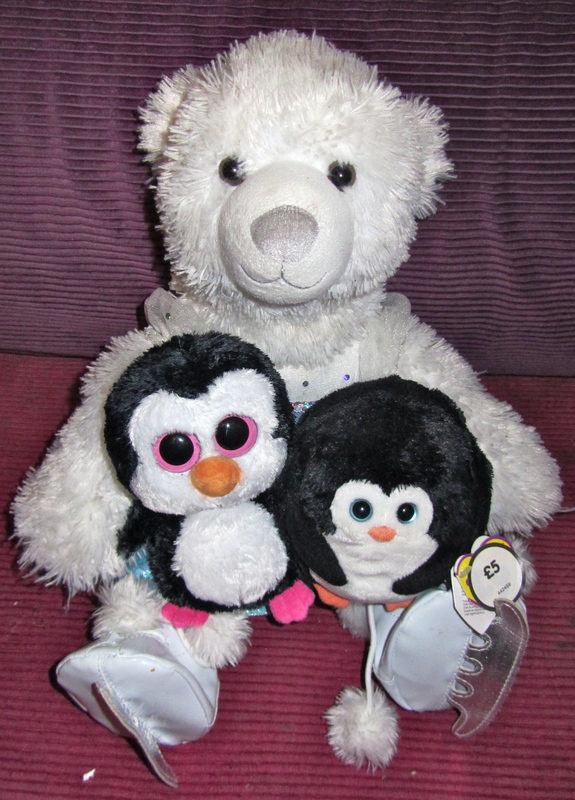 Petrone and Pentacle felt a scared (I’ll tell you why in a minute) so they found Snowy the Polar Bear to take care of them. He’s says he’ll teach them to ice-skate but they’re not keen on being seen at the ice-rink with a Polar bear in a dress. These three ganged up on poor Parnassus and shouted ‘Put yer flippers up! They said he had a daft name and threatened him with a Star Trek gun, luckily it was only set to ‘Stun’ so he was unhurt although rather shaken. Penguin gang warefare is a new phenomenon here and we are considering involving the Penguin Police. This is why the others found it necessary to find a Polar Bear bodyguard for safety, even if he is wearing a tutu. To be absolutely honest, I think I’ve reached the point where I have an elegant sufficiency of penguins (and I want my bathroom back!) – but if you have already arranged to send a penguin, please feel free to! I just have to be careful not to overstretch myself, as these do all have to be posted on to Post Pals by me. With that in mind, if you haven’t been able to find a penguin to send, please consider donating towards postage, it would help a lot. I have a couple of lovely couriers who have expressed an interest in this project, but I haven’t been able to arrange anything solid or costs or anything just yet as I have an unknown quantity of penguins so far to transport. If you’d like to have a look at the Penguin Amnesty Gallery Part 1 to see what the other penguins have been up to, please click HERE! Also, if you’ve sent me a penguin and they haven’t been featured, please do let me know! The Royal Whale / Royal Mail I should say (I’ve got fish on the brain) isn’t always quite as reliable as it should be sometimes, although they’ve done me proud so far I think. I’m hoping to do the Penguin Amnesty vlog next weekend and am praying for snow rather than rain as it would be soooo much more appropriate and it would be a nice change to drizzle to be honest. Anyone who donates penguins or postage will be credited for their kindness on here, and the penguins, Post Pals and I will love ya forever too! Can’t beat that!